Moving into your first apartment as a newlywed couple can be a very exciting prospect. You get to start your life together in earnest, picking the right apartment, and furnishing it according to your tastes. The problem is, however, that the furnishing and decoration has to be done according to both of your tastes, which can sometimes be challenging with diverging personalities and interests. 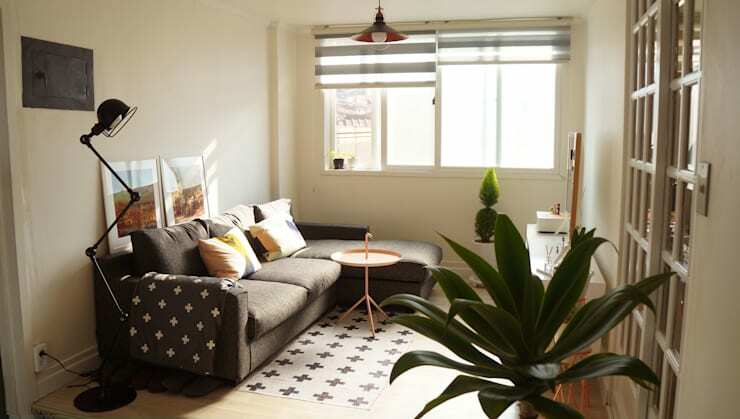 One couple in South Korea did the smart thing, however, in enlisting the expert assistance of Toki Design in revamping the flat which is to become their first home together. Once you get a look inside this tiny city apartment, you will be astounded by the achievements of the overhaul. The work that had gone into the project had been so tailored to the space, that it seems impossible to have done any better. The end result is a hip and charming residence for a dynamic, young couple, and certainly the ideal first flat in anyone’s book! 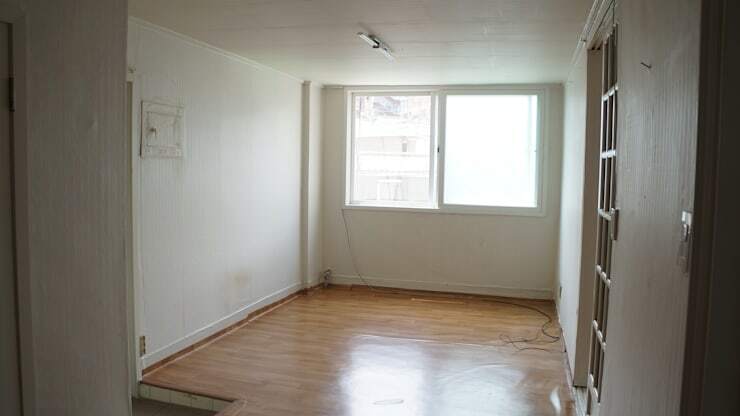 So let’s start out with what the general living space of the apartment looked like before. As we can see from this angle, which allows us a view of the living room area, the dimensions of the apartment are not too generous. Well, we can surely not expect much more, since living in the city already has its limits, and for a first home, we often have to settle for more modest spaces. This definitely does not mean that the area has to feel cold and constricted, as we will see soon (spoilers!). The flooring in this area is a vinyl laminate in a wooden print. 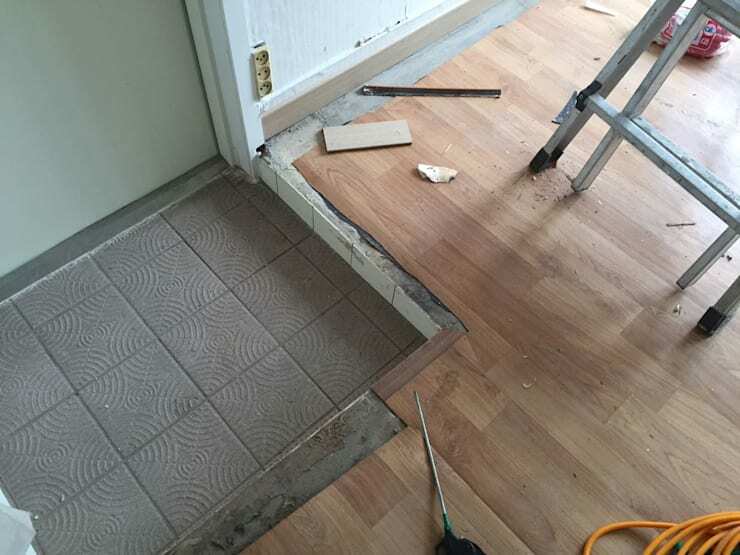 This is often a cost-effective and durable option, but as we can see with this space, it is starting to bubble up in certain places, while the strips are roughly lined up to the skirting on the wall. Regardless if these problems came about due to poor installation or water damage, the flooring certainly needs a do-over for it to look at all attractive. We can barely say that we are looking at the same space as before! The dingy and small living room we had seen before has been transformed into a space well worth spending countless hours in. Firstly, the designers took up the obvious advice regarding the floor, and replace it with wooden panels in a softer colour and a more natural hue. With the abundance of indoor plants and the photographs of nature scenes, we can certainly see that our newlyweds are nature-lovers, and the new wooden floor fits this theme very well. An L-shaped sofa fits snugly into the corner of the room, allowing for ample seating space, whilst not taking up too much floor area which could have been used otherwise. The decorative objects and lighting features are all very trendy elements, appropriate to the age of the inhabitants. The most notable thing about this new living room, however, is that it does not seem to have cost a fortune, although it looks fabulous. No other alterations had been made to the apartments physical structure, save the floor, and yet the mobile items look just as at home and comfortable as any permanent features would have. Given, the image we see here must have been taken whilst the renovation was already in progress. Taking this into account, though, the spatial layout and features of this previous kitchen just look all wrong. At the back we can see carpentry on the wall which looks out of place and anachronistic. Besides that, it also looks like it has already suffered some damage and is ready to fall in. To the right, a very large free-standing cabinet takes up an entire wall itself. This outdated wooden feature is very bulky and dark, completely the opposite of what you want in confined spaces. Now, isn’t this a sight for sore eyes? We are looking at the kitchen from a different angle now, but you definitely get the general idea of the renovation’s impact! At the back, all of the cabinets and counter space have been aligned to maximise on the use of space and free up more moving area in the front. The laminated, startling white cabinets are contrasted by classy, matt black tiles in the backsplash area. This ensemble is subtly complimented by the light wooden flooring we also saw in the living room at first. A little closer to us in the image, we can see a small dining room area. It is, in fact, larger than a standard breakfast nook, as it can comfortably seat up to six people. 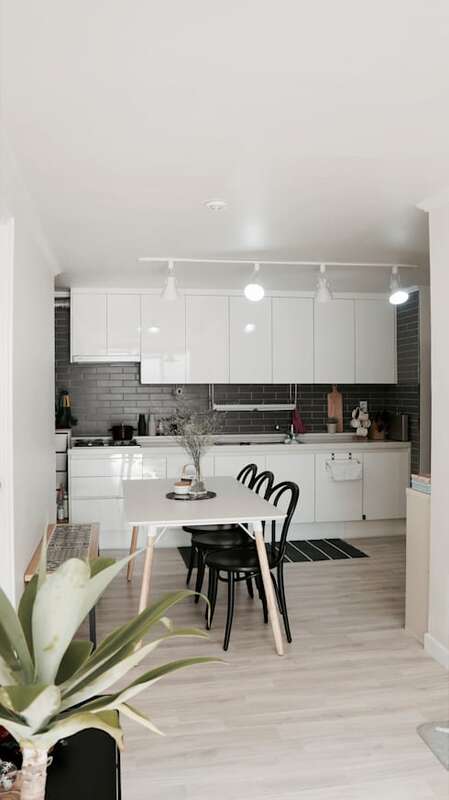 The alteration between black café chairs on the right and decoratively tiled bench on the left speaks to the creative side of the inhabitants and brings visual interest to the kitchen space. To our right we can see the wall against which that bulky cabinet had stood in the picture, and from just the edge of it, we can see that the designers had opted for more light-weight counter space. A welcome choice! 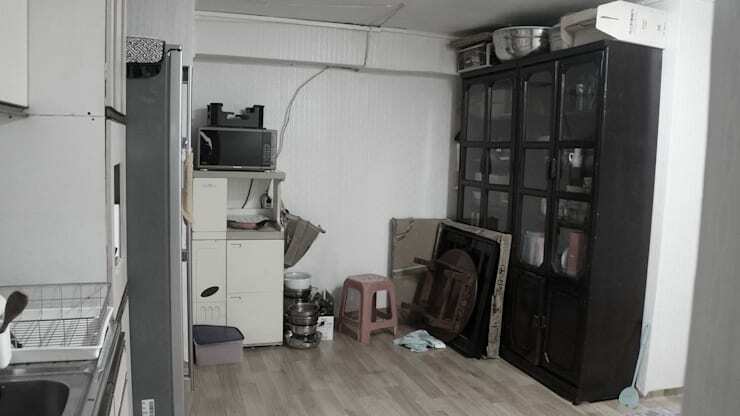 Usually we start with the entryway when inspecting a home, but today it will be the last site we mention before exiting this quaint South Korean apartment. Pictures from the renovation clearly exhibit that this doorway could not possibly have been a warm welcome to anyone at all. Dreary tiles are your first sign at entrance, and that would only lead up to the mistreated laminate floor we saw at very first. 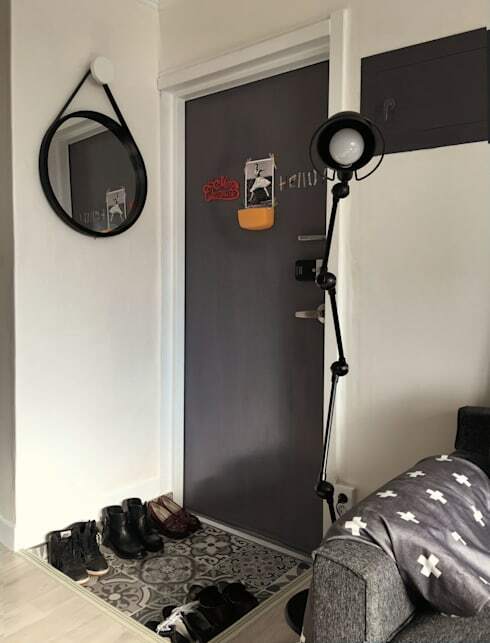 Something had to be done with this space, especially since the apartment is so small and the owners won’t have much opportunity to make a good first impression beyond this. It seems that the Toki Designers knew exactly just what this home needed in every corner. The entryway to the apartment, small as it is, has transformed into a welcoming space that is lively, but not overwhelming. The dull grey tiles had been replaced with hydraulically pressed ones in eye-catching patterns, although they are still monochromatic as not to break the colour scheme of the room. The door extends this colour scheme, and becomes a solid beacon amongst the white walls and ceiling of the room. A trendy round mirror graces the space to the left, ensuring one last good look before you enter the outside world. This is the way to start your day! Hungry for more? You can take a look at another newlywed home transformation right here. Which space was the best transformation for you? Which room did you like most? Let us know in the comments!